Norman Mailer‘s 1973 photo-biography, Marilyn, comes 8th in Bookfinder‘s list of the most in-demand, out-of-print books. The book was a bestseller on publication, and it is still easy to find used copies at reasonable prices. For those with money to spare, Taschen have republished Mailer’s original text in a deluxe package, with photos by Bert Stern from 1962. A new, limited edition book featuring photographs by Bert Stern and text by the late Norman Mailer will be published by Taschen in August. It is 278 pp long; 36.5 x 44 cm; hardcover, boxed with print. All 1712 copies are signed by Stern himself, and the price – wait for it – is a jaw-dropping £450.00. 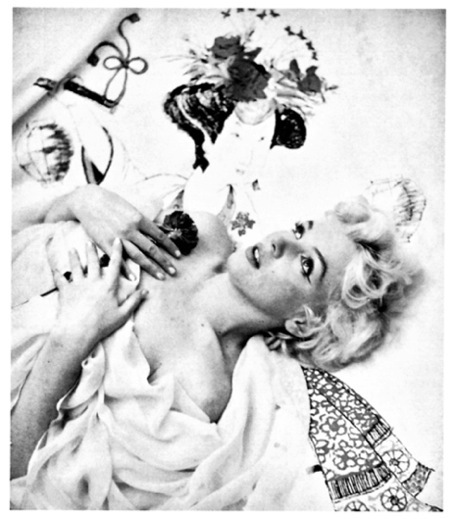 Diana Vreeland, the formidable editor of Vogue and Harper’s Bazaar, included this photo of Marilyn (taken by Cecil Beaton in 1956) in her 1980 book, Allure. 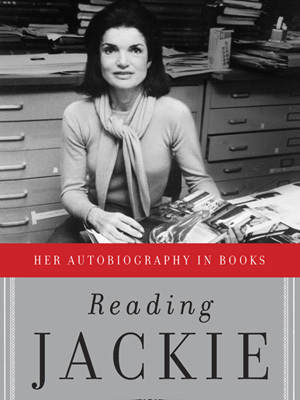 Vreeland worked with Jackie Kennedy on the project, as William Kuhn recounts in Reading Jackie, a new study of the one-time First Lady’s career in publishing. “Marilyn Monroe had a brief affair with JFK, and by 1980, when Vreeland’s Allure was published at Jackie’s behest by Doubleday, this was well-known…Monroe had committed suicide during the very week that Vreeland was taking over the editorial position at Vogue. She began work just as the outgoing editor was putting together the finishing touches on an issue which, by chance, included an article with a tribute to Monroe and several photographs. Vreeland’s colleague wanted one of the photos taken out. It was too ‘triste’ in light of what Monroe had just done. Vreeland replied, ‘You can’t leave that out! You cannot! It’s got all the poignancy and the poetry and the pathos of the woman in it!’ That was in 1962. In the late 1970s, Vreeland explained what she loved about this photo … ‘Marilyn Monroe! She was a geisha. She was born to give pleasure, spent her life giving it – and knew no other way’…What did Jackie say to Vreeland about the Monroe photograph? Probably nothing, but the fact that she silently allowed Vreeland to include it shows Jackie content to acknowledge Monroe’s ur– sexiness, a quality that Jackie did not think she shared with the screen icon. Over at The Mmm Blog, Melinda Mason recounts her meeting with photographer Bert Stern – now 82 – at his ‘Jewels’ exhibition in Toronto’s Izzy Gallery. Photographs of Marilyn taken by Bert Stern in 1962 are included in a new exhibition, ‘Jewels’, running from June 16 – July 9 at the Izzy Gallery, Toronto. Stern’s portraits of Elizabeth Taylor, Sophia Loren, Audrey Hepburn, Madonna and Kate Moss are also featured. 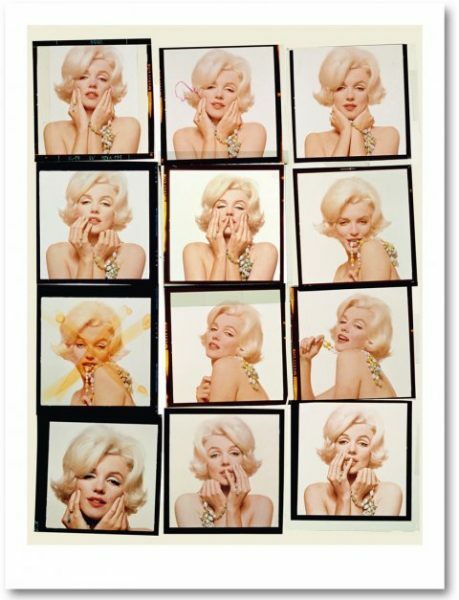 ‘Beauty Culture’, a new exhibition at the Annenberg Space for Photography in Los Angeles, includes a sub-section devoted to Marilyn Monroe and her many imitators. 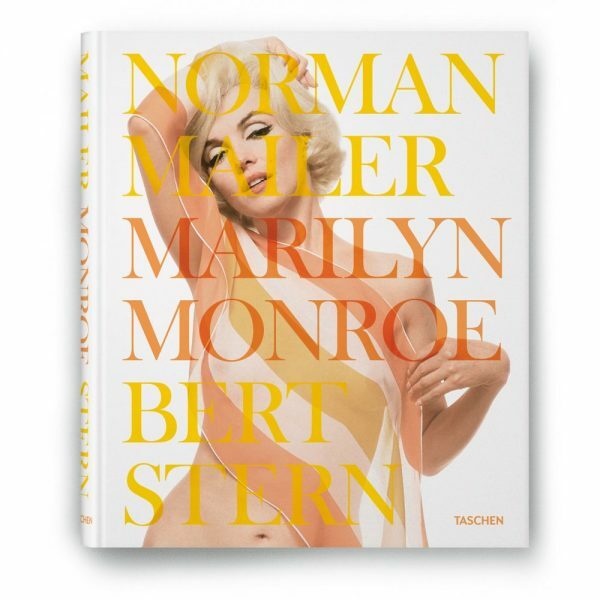 Photographers Bert Stern, Bob Willoughby, and Joe Shere, who all worked with Marilyn, are listed among the contributors. 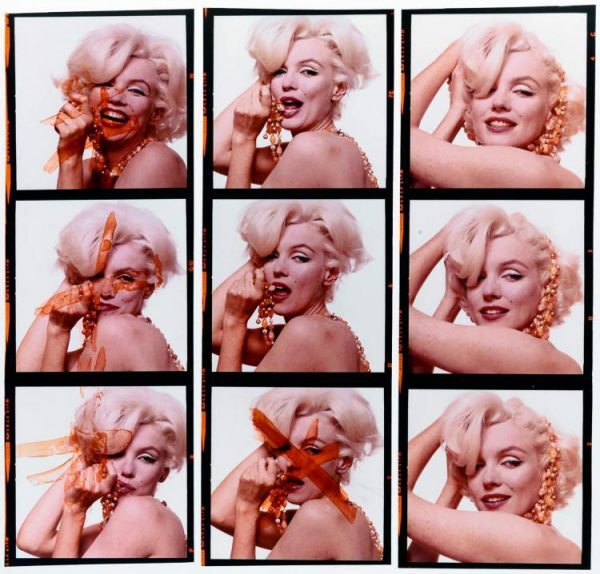 An enlarged Fuji Crystal Archive print contact sheet taken from Bert Stern’s ‘Last Sitting’ with Marilyn in 1962 (printed 1979, recently valued at $14,000 – $18,000), features in the Important Photo Books and Photographs auction at Swann Galleries, NYC, on May 19. 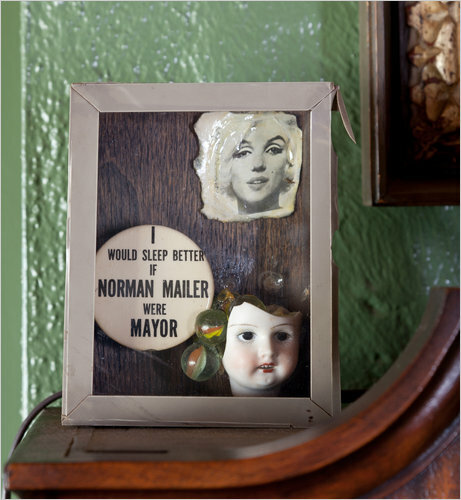 This framed collage – including a badge from Norman Mailer‘s 1969 NYC mayoral bid, and a photo by Bert Stern, used in Mailer’s controversial book, Marilyn (1973) – is one of the author’s personal items being auctioned this spring, along with Mailer’s Brooklyn Heights apartment, following his death in 2007. This new book by William Kuhn, dubbed an ‘autobiography in books’, takes a look at Jackie Kennedy Onassis’s lifelong love of literature and her later career as an editor. “More astonishing is Jackie’s work on the 1980 Diana Vreeland book, Allure, which contains photos and text about the allure of Marilyn Monroe, who was linked to Jackie’s first husband when he was president, and Maria Callas, who was linked to Jackie’s second husband, before and after their marriage. In fact, Jackie may never have resented Marilyn as many have assumed. She probably understood Monroe’s struggle with fame and love only too well, and was privately said to be upset by her death. Whatever the extent of Marilyn’s relationship with John F. Kennedy, it appears that Jackie did not bear a grudge.